This pair of small barns is familiar to many Clevelanders, especially those who drive by the intersection of River Road and South Woodland in southeastern Cuyahoga County. The late morning light cast geometric shadows creating an irresistible Edward Hopper-like solitude. 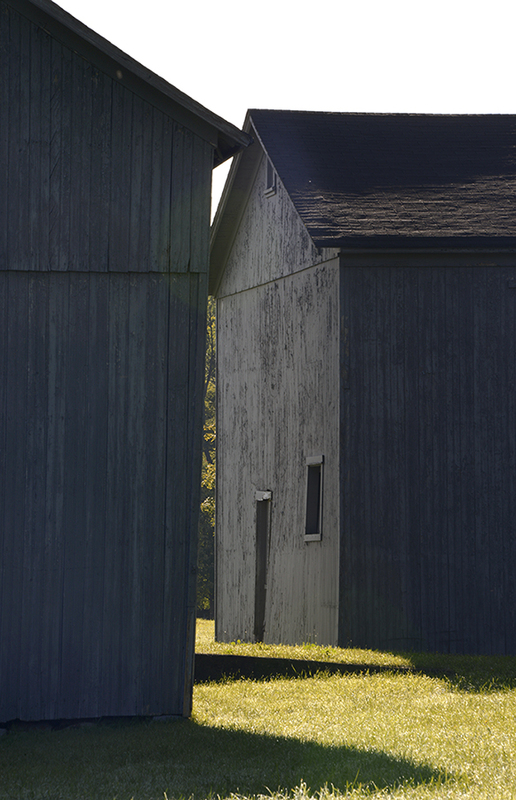 I wanted to capture an original view of these barns, one that didn’t “announce” the location but would be immediately recognizable once disclosed. Vertical lines anchor the image compositionally, and the oblique angle of light allowed me to make a stronger statement in black and white than color. By distancing the second barn and keeping the first in shadow I was able to create stronger separation and the illusion of solitude. The strong sense of depth in this image derives from the broad tonal range and the local use of contrast. This was one of two barn images from this series selected by Tari Designs (Dallas, Texas) for display on glass panels at the Cleveland Clinic’s new hotel on their main campus. The images will be printed on five to six foot glass panels and displayed in the hotel’s lobby. Also, the design firm has purchased several large canvas prints from my Northeast Ohio landscapes for display.